Presiding over approximately 40 establishments located worldwide, Peruvian chef Gastón Acurio will launch his first restaurant in France in mid-October 2015. Just off the Champs-Élysées, Manko will include a bar and a cabaret. The menu will feature Peruvian favorites such as tapas, ceviches, sea bream and spicy beef fillet. Manko, 15, av. Montaigne, 75008 Paris, no phone. 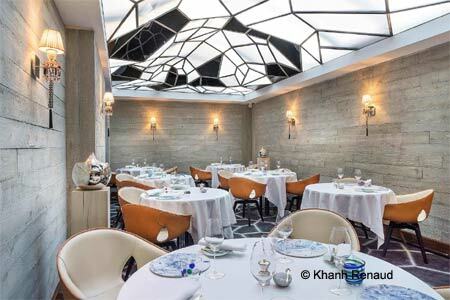 Thibault Sombardier helms Antoine, a luxurious seafood restaurant near the Pont de l’Alma. In October 2015, he will open his own bistro, Mensae, in the Buttes Chaumont area. Expect traditional fare and a cozy atmosphere. Mensae, 23, rue Mélingue, 75019 Paris, no phone. Chef of Spring, Chicago-native Daniel Rose has opened a bistro near the Palais Brongniart, La Bourse et La Vie. Helming the kitchen, Marie-Aude Mery and Rose’s stalwart Harry Johnson craft traditional fare like mackerel fillets marinated in white wine, pot-au-feu with veal head, and chocolate mousse with coffee beans. 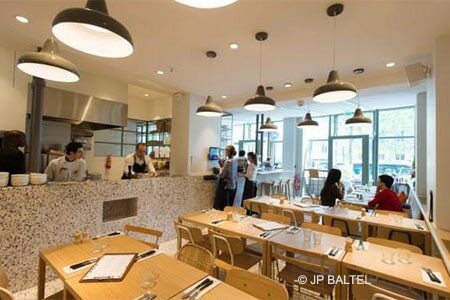 Lunch & Dinner Mon.-Fri. La Bourse et La Vie, 12, rue Vivienne, 75002 Paris, 01 42 60 08 83. Jean-François Piège has launched his new establishment, Le Grand Restaurant, near the Madeleine church. The menu includes refined and creative dishes. Lunch & Dinner Mon.-Fri. Le Grand Restaurant, 7, rue d'Aguesseau, 75008 Paris, 01 53 05 00 00. Chef Christian Constant has opened his new restaurant at the Sofitel Paris Arc de Triomphe. It is called Les Cocottes after the name of his famous establishment on the Left Bank and seats 90 people. The menu includes simmered courses like honey-lacquered cod and caramelized potatoes stuffed with pig’s foot. Les Cocottes, Sofitel Paris Arc de Triomphe 2, av. Bertie Albrecht, 75008 Paris, 01 53 89 50 50. La Marée Jeanne is a trendy restaurant dedicated to seafood. Sit at a table or at the wooden counter and enjoy simple yet palatable cuisine. Appetizers are served out in little portions in order to be shared, like the fried smelt and the marinated sardines with green peas and red pepper cream. Among the signature dishes, go for the “croq’homard,” a kind of croque monsieur from the sea. La Marée Jeanne, 3, rue Mandar, 75002 Paris, 01 42 61 58 34. Imagined and helmed by Delphine Plisson, former manager of a fashion brand, Maison Plisson is dedicated to topnotch ingredients. Three-thousand references are sold here, ranging from meat, delicatessen, fruits and vegetables to cheeses, bread and coffee. Fare is simple but tasteful, such as the tomato gazpacho with olive oil, cucumber dices and goat cheese, salt cod and smoked haddock with potato mash and pesto. Maison Plisson, 93, bd Beaumarchais, 75003 Paris, 01 71 18 19 09.